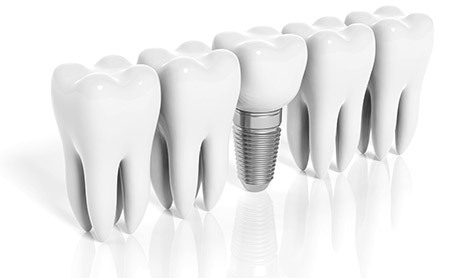 With great advancements in dental technology and techniques, dental implants have become a great solution for patients who must replace teeth that have been lost due to injury, gum disease, or tooth decay. Many patients have found the use of dental implants to be life changing. On a practical level, the advantages are great as a patient realizes he can eat easily because his dental implants will not fall out. These patients also discover a renewed sense of confidence and energy because they can fearlessly laugh, speak, and smile in social situations. Dental implants are a wise investment. Dental implants will definitely last longer than dentures. While bridges and dentures replace missing teeth, they provide absolutely no underlying support for the jawbone. This allows the bone structure in the jaw to eventually dissolve away. This can provide long-term problems with the integrity of the bone structure. Dental implants address this problem by attaching the replacement teeth to rods that have been implanted directly into the bone structure. Dental implants are also reported to be much more comfortable to wear than dentures. The replacement teeth used in dentures are attached to a base which tends to feel bulky in the mouth. However, the replacement teeth used for dental implants are embedded directly into the gums and jawbone. Consequently, they feel just like your real teeth as you eat or talk. Dental implants also look much more natural and realistic than dentures. With implants, the replacement teeth feel and look natural. Because of the way they are attached to your jawbone, it is nearly impossible for anyone else to tell that they are not your real teeth. Of course, this brings a great sense of relief and confidence to the patient who is wearing them. New roots are provided for your replacement teeth by way of small metal anchors that are surgically embedded directly into your jawbone. Small titanium posts are then attached directly to these metal anchors. The replacement teeth are then attached directly to the small posts. This process will usually take six to eight months to complete. However, another advantage is that it will normally not interrupt your normal daily schedule in any major way.